Does The Eyebrow Trimmer Have Good Battery Power? Go for the trimmer that allows you to complete the grooming process without charging. This is critical if you go for the cordless products. Whereas they offer you the convenience of trimming your eyebrows without worrying about being entangled in wires, it should perform optimally. It should last for a few hours before recharging. You may want to replace the battery often for better functionality. Is the Blade’s Quality Unsurpassed? When it comes to trimming your eyebrows, the end justifies the means. 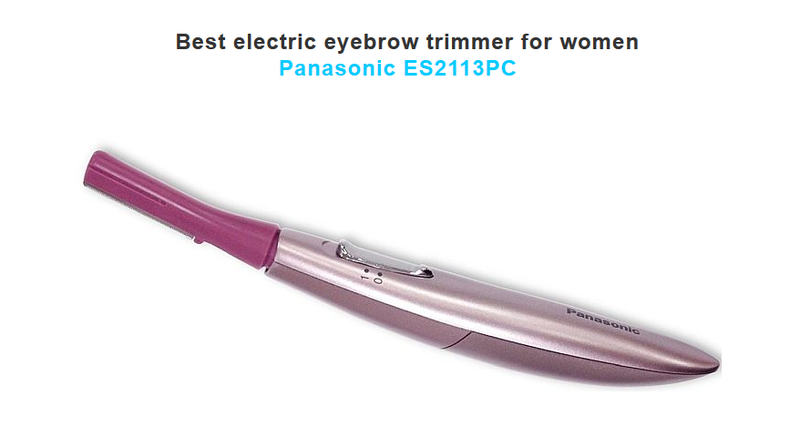 The best electric eyebrow trimmer for women features a sharp blade that can cut the hair without pulling it. Whether you have sensitive skin or not, you should be in a position to enjoy the benefits of a smooth trim. The discomfort, ingrown hairs, and irritation must be avoided at all costs. It is worth noting at this point that the stainless steel blades are likely to offer you better results than other materials. If you happen to have super-sensitive skin, then finding products made from hypoallergenic metal is advisable. Are You Satisfied with the Eyebrow Trimmer’s Design? A good trimmer will have a design that allows for a firm grip. You should be at liberty to maneuver the eyebrow and get the perfect results. This is achieved by the inclusion of a non-slip feature. It should be portable enough, so that you can avoid keeping unkempt eyebrows while on-the-go. The packaging must be perfect so that you carry it anywhere. This also allows you to view the features even before you open and use the product. Some of the products are designed to perform multipurpose functions. From the eyebrow trimming, nose hair trimming, to the ear hair trimming, they can do it all. Others come as a package, where everything you need such as combs and creams are included. Ensure that all the products included are of good quality and can perform the functions to satisfactory levels. More so, the product must be attractive and appealing. The colors and design must scream femininity from afar. Otherwise, you may never be motivated to engross in the engaging yet important eyebrow trimming process. Can You Clean The Eyebrow Trimmer Easily? Failure to clean an eyebrow trimmer could be costly. It is responsible for the infections and irritations on many women’s skin. Accordingly, find a trimmer that can be cleaned and maintained with ease. It must withstand being submerged in water and require little maintenance. Can The Trimmer Withstand Shock? As you may have noted, the eyebrow trimmers will slip from your hands as you try to get the clean look and at the same avoid cutting the skin. The trimmer must not break if it falls but instead continue to serve its purpose for a long time. It is also crucial to find a product that has a protective cap for safety purposes. Does The Trimmer Emit Least Noise? Avoid taking home a product that announces to the world that you are trimming your eyebrows by making a lot of noise and vibrations. No one needs to know these details. Always go for the less noisy trimmers. What Are The Professionals and Reviews Saying? You can make a decision by going through the reviews on the credible websites. If the customers have tried them and were satisfied by the results, they will make positive comments. The professional eyebrow trimmers will also prefer some products to others. Consult widely before narrowing down to a specific brand. Is The Product Available and Affordable? A good electric eyebrow trimmer does not have to be costly. It should be offered at a reasonable fee. Compare the prices at different stores before making the purchases. You may save some money in the process. It is also wise to go for trimmers that are readily available since you will be replacing them often. Forget about the rigorous advertising and promotion campaigns about the electronic eyebrow trimmers. Instead, be cautious enough to consider the different features described here and you will never be disappointed. Previous Article← Why we should hire a wedding planner for perfect wedding?